I mentioned that I had bunches of peaches, Deb at Kids Out and About is dealing with piles of cabbages, and the latest produce overwhelming me is hot peppers. Okay, so, for a while, I was doing well. We love to make salsa. And Cute W threw some peppers in with his homemade pickles. That meal that the girls wanted to avoid last night? It was this scrumptious Thai Beef with Chiles recipe. But the peppers just. keep. coming. I don’t really like dried peppers, which would otherwise be a good option. 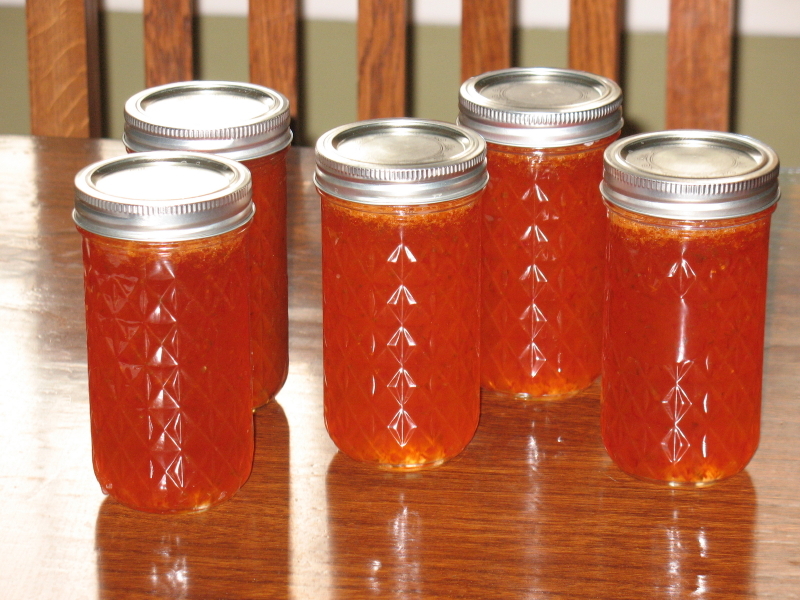 I decided to try to make pepper jelly. My mom’s friend used to give us a jar of pepper jelly every Christmas. Sounds weird, but it’s pretty scrumptious spread with cream cheese on a cracker. 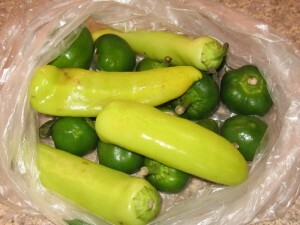 So I purchased a bunch of supplies because I can’t bear to throw away $5 or $10 worth of peppers. But whatever. I rationalized that if I were successful, I’d have some lovely homemade jellies to give away at Christmas. 1 ½ boxes of Certo, or 3 pouches (You can’t cut the sugar or it will not set, although you might be able to try a lower-sugar Sure-Jell). Put jelly jars through Hot Dishwasher Cycle. Pour ground peppers, sugar and vinegar in a very large deep soup or lobster pot. 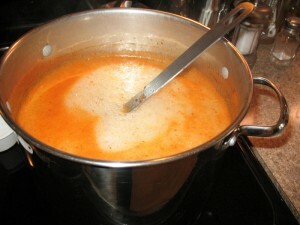 Boil approximately 8 minutes (mixture wants to boil over so don’t take your eyes off it). 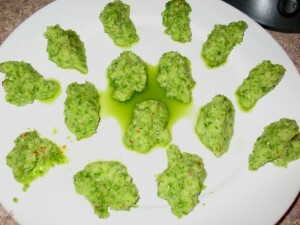 Cool slightly and add Certo. 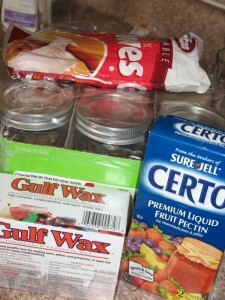 Add Jelly to jars. 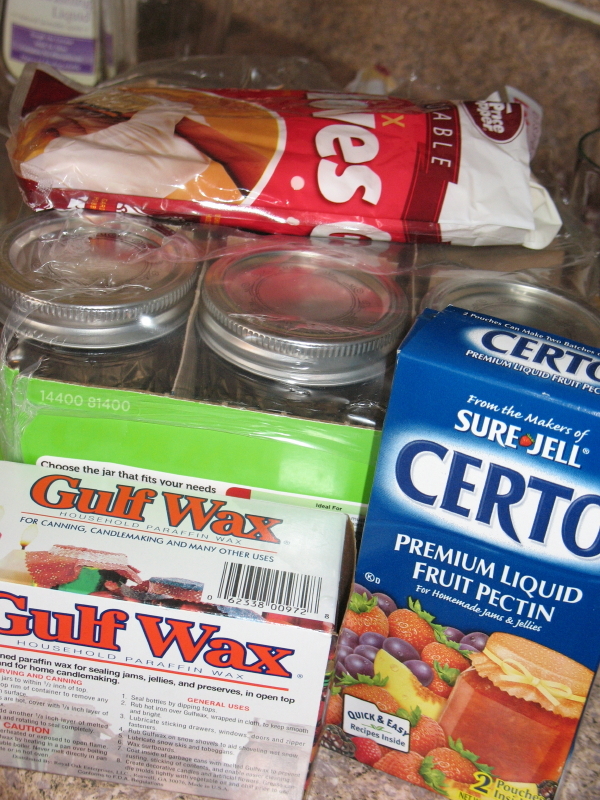 The original recipe says to seal with paraffin wax, but if you have a new lid it’s likely treated so that it will seal. 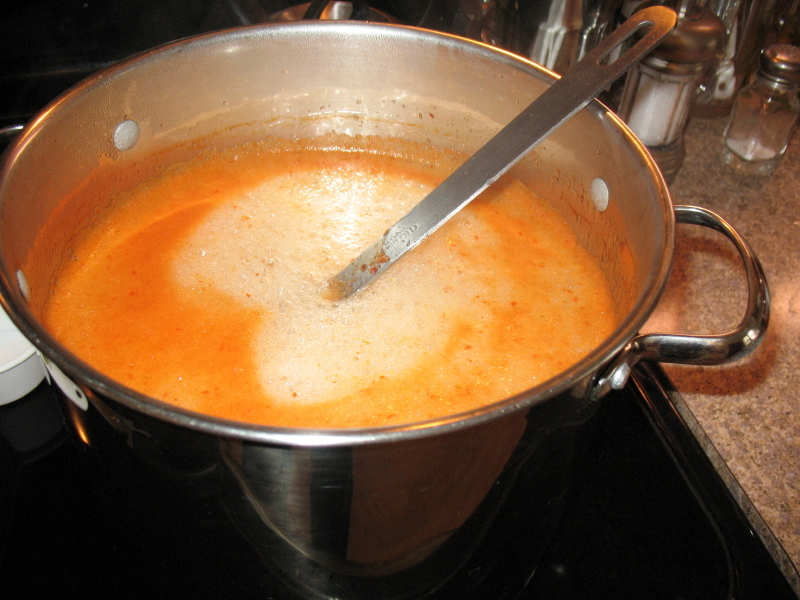 My recipe doesn’t say to do a boiling water bath, but it’s recommended by most people. But since I’m lazy and I like to live dangerously, I skipped this step. I’ll open up a test jar before I start handing it out. So, it was a bit of a project. 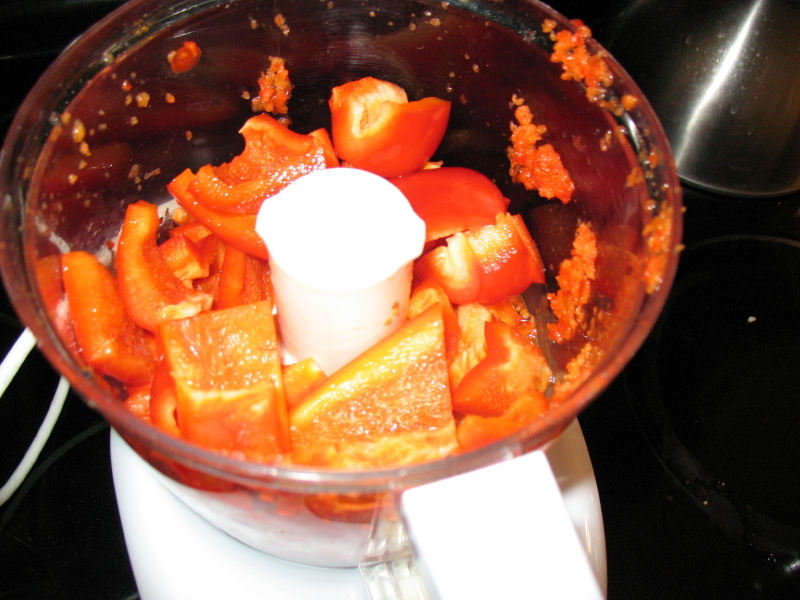 I pureed a bunch of red peppers. That was easy. But the hot peppers–ugh. There were so many, and they were so hot, that I was hacking and coughing just trying to get them seeded. I had latex gloves, but I was wishing that I had an oxygen mask. It was so much trouble, in fact, that I pureed a whole bunch of additional peppers to freeze for later. 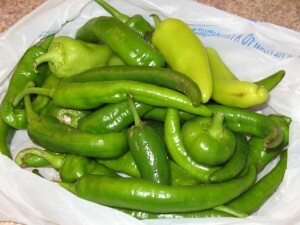 We won’t need to buy peppers anytime soon. When I’d read the recipe about how the mixture “wants to boil over,” I thought that it sounded pretty silly. And it seemed even sillier when my ingredients only reached the bottom fifth of the pot. So, cocky, I left the room to help the girls with something, and when I came back, the boiling goo was alarmingly high. At this point, it was also smelling just like the pepper jelly I knew and loved. Hooray! And it’s pretty, too. The picture below doesn’t do it justice–not at all. It’s glowing translucent with teensy flecks of peppers all through it. I used plenty of peppers. Ate a pepper dinner, made a batch of pepper jelly, froze enough for a second batch, along with a whole bunch of plain hot pepper puree. So, I checked the bag full of peppers sitting on my counter, thinking it must be almost empty, right? That would be a no. A big no. Which would almost be okay. Put them in pint or quart baskets on a table at the end of your driveway with a pencil box with some change in it, mark with a price and sell them. Thank you, victoria, for giving me emotional permission to make others eat some. I unloaded a bunch at church this morning.